Your engine's cylinder head contains intricate moving parts such as lifters and valves, moved in sequence by the camshaft. Your engine's lower end contains pistons, attached to the crankshaft that also move in perfect sequence. The top and bottom ends of your engine have to work in perfect harmony for your engine to run efficiently and powerfully. Keeping them precisely timed together is the timing belt. Your engine's timing belt is a toothed rubber belt that is reinforced with fabric strands or kevlar, making it strong and durable. It makes sure your engine's moving parts work together to generate the power you need to operate your vehicle. 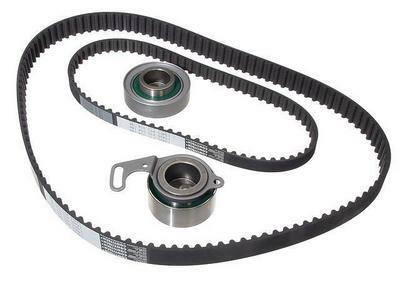 The timing belt is subject to wear and tear, from operating over tens of thousands of miles, and simply from age. The rubber deteriorates over time and begins to crack, and the teeth on the belt may even begin to separate. Your timing belt may stretch over years of use as well. Your timing belt replacement interval should be closely followed. Timing belt replacement is typically suggested every 60,000 miles, although some manufacturers may allow extended intervals. If you choose to ignore or delay your timing belt replacement, the timing belt can stretch, causing poor running conditions. Worse yet it can break, often resulting in extensive engine damage that can cost thousands of dollars to fix. Be sure to have your timing belt replacement performed at or before its recommended interval. This will ensure long-lasting, efficient engine operation and prevent costly damage to your engine. At Babcock Auto Care, our ASE-Certified Master Technicians use modern equipment and up-to-date methods to thoroughly diagnose your timing belt replacement needs. The health of each component, such as the timing belt, idler and tensioner pulleys, crankshaft and camshaft sprockets, and water pump, will be inspected. We will advise you of any concern we find, the severity of it, and what will need to be replaced to keep your vehicle in top condition and safe on the roads. Because economy timing belts can fail prematurely, we only use high-quality parts for your timing belt replacement. All timing belt replacements at Babcock Auto Care are backed by the best warranty in the business.